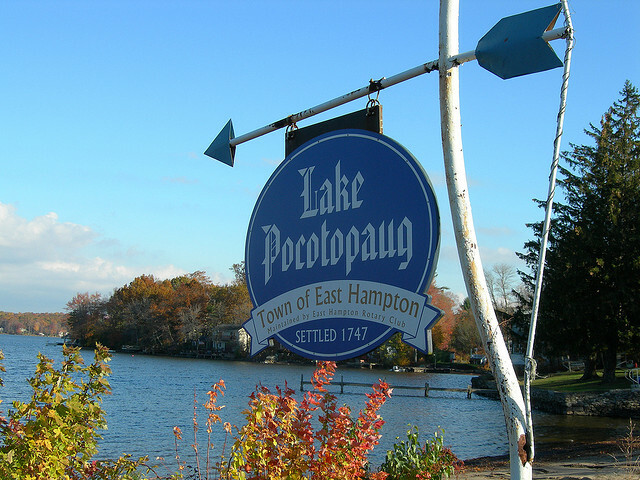 East Hampton is home to one of Connecticut’s largest inland bodies of water, Lake Pocotopaug. Consisting of an area 9 miles in circumference, the lake dominates the local landscape and has a history of serving the community through a variety of different functions—from natural resource for early inhabitants and later recreational uses to powering industry and supporting economic development in East Hampton. The clash of these competing interests, however, often proved controversial and has been a source of contention throughout much of the lake’s recent history. Wangunk communities had long made use of the lake and surrounding areas by the time European settlers arrived on the scene. A story, of unclear origins, involving Lake Pocotopaug circulated among the settlers and even today is part of local folklore. One version purports that a Native woman drowned herself in the lake and her sacrifice charmed the waters into sparing the lives of future generations of lake-goers. Long after European settlers claimed the land surrounding the lake, its pristine waters and beautiful scenery became the basis of a burgeoning tourism trade. The development of waterfront cottages and hotels brought summer residents to East Hampton throughout much of the 19th century. 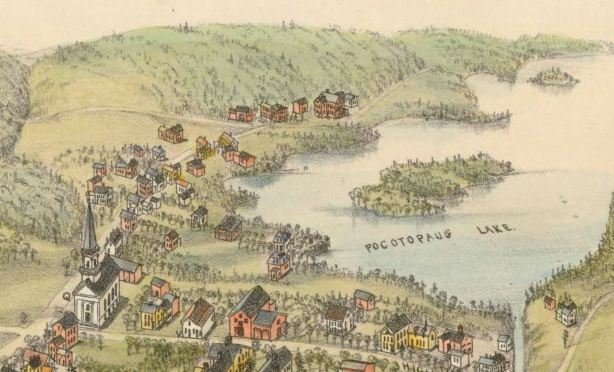 Similarly, the waters of Lake Pocotopaug drew industry to the area during this same period. Local manufacturers used water from the lake to power the turbines necessary for the growth of their businesses. Local residents did not approve of using the lake’s waters for industry, however, as they feared manufacturing interests drew water at rates only meant to optimize corporate fortunes and did not take the health of the lake into account. In addition, reliance on the lake’s waterpower actually left local rates of employment susceptible to changes in the weather. In 1899, drought conditions cut power to local factories, forcing them to shut down. Nearly 30 years later, in December of 1927, heavy rains and melting snow caused an entirely different problem, as the lake flooded downstream manufacturing facilities. Throughout much of the 20th century, hotels and casinos along the waterfront drew an increasing torrent of motorboat traffic that proved a menace to cottage owners along the lake. Bathers complained of emerging from the lake covered in oil and lobbied the town for an increased police presence on Pocotopaug’s waters. A pact between cottage owners and motorboat-driving tourist industries dictated that motorboats operate at slower speeds, be off the lake by 11:15 pm, avoid sounding fog horns, and cease making sharp turns that might cause “women passengers to scream,” but this did little good. Changing economic conditions throughout the 20th century brought lasting change to the lake, however. Industrial abandonment of waterpower and upgrades to dams and spillways helped ensure more consistent and controlled supplies of water in the lake. Additionally, tougher environmental laws and restrictions on boating helped stem the abuse of motorboat traffic. Today, Lake Pocotopaug supports a thriving residential lakefront community committed to providing fun and recreation through environmentally responsible programming.